But in 1961, the United States closed its embassy in Cuba and then, in the infamous Bay of Pigs invasion, attempted to overthrow the Cuban government. In response, Cuba asked the Soviet Union for missiles to protect itself with, setting off the 1962 Cuban Missile Crisis, which in turn led to the cancellation of direct flights between the United States and Cuba. 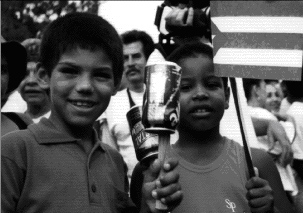 When it became obvious that the Cuban children’s parents would not be coming to the United States any time soon, the Catholic groups collected the children from Miami refugee camps and disbursed them among orphanages and foster families throughout the country. Five or six years later, when political tensions with Cuba had decreased, most parents made their way to the states. But by this time, many of their children had forgotten Spanish and could no longer communicate with them. Others couldn’t recognize their parents and even challenged their identities. Throughout the entire operation, the U.S. press released few, if any, stories on this massive exodus that linked church and state and spent an unknown amount of taxpayer money on a plan not even known about by the public. Today the Miami Cuban website www.NoCastro.com chastises the Cleveland Plain Dealer for having published an article about Operation Peter Pan in 1962, claiming that the newspaper broke the spirit of cooperation, suggesting collusion between the U.S. government and the press. I first learned of this story while living in Cuba during a period that, in future history books, will probably be referred to as “The Time of Elian.” The Elian Gonzalez custody battle was one of the few Cuban news stories to receive major coverage in the U.S. press in recent years. And in Cuba it also dominated the newspapers and the two government-owned television stations. People were sick of hearing about Elian by the time I arrived in Cuba last February. Everywhere I went in the country–from Havana’s famous malecon seawall to dusty street corners in the tiny town of Baracoa–Cubans rushed up to me hungry for news of what else was going on in the United States. Because the U.S. embargo is not only a blockade of food and medicine but also a stranglehold on the transmission of information, I was suffering from a similar sort of ignorance when it came to the lives of these Cubans. Together we created impromptu information exchanges. And through these friendships I learned of a Cuba rarely covered in the U.S. media. I met people who had volunteered in the 1961 Literacy Campaign when one hundred thousand Havana residents moved to the countryside to teach the peasants to read. Several volunteers were murdered by counterrevolutionary peasants who, most Cubans believe, were paid by the CIA. I heard a trova or political folk singer criticize Fidel Castro at the National Symphony. I met a doctor who had been living in Africa along with thousands of other Cuban physicians who offered free medical care to the poor. And I learned about Operation Peter Pan. This story has parallels to the Elian crisis and perhaps at one time could have elicited similarly strong emotions, but it is a story that even today, nearly 40 years later, remains locked away in the confidential files of the CIA. During my first month back in the United States, I asked everyone I knew if they’d heard about Operation Peter Pan, but not one person had. People asked me only about salsa clubs and santeria, poverty and the pending death of Fidel. And, of course, Elian and the Buena Vista Social Club. It was all they knew of Cuba. Then in August I went to Berkeley for the screening of Fidel, a documentary about Castro. I learned that its producer, Estela Bravo, a 67-year-old U.S.-born filmmaker who has been living in Cuba for the past 36 years, was also working on a documentary entitled Operation Peter Pan. The following month, in a telephone interview to Havana, I spoke with Estela about Operation Peter Pan, her filmmaking, and her thoughts on both the Cuban and U.S. media. MediaFile: How did you end up moving to Cuba? Bravo: My husband is Argentine, so we were living there when he came home one day in 1963 and said, “How would you like to go to Cuba?” He’s a biochemist and had been asked to teach at the medical school there. I went, thinking it would only be for a year, but they asked him to stay longer. MF: Have you always worked as a filmmaker in Cuba? Bravo: No, I worked as protest song director at Casa de las Americas, a cultural institution in Havana. We did programs about love songs, work songs, hootenanny type of things. And then we started doing it for TV. That’s when I became active in TV and film. MF: When was that, and what made you decide to do documentaries? Bravo: In 1979 I started working on documentaries about Cuba because in that year there was a big group of Cubans moving to Miami but there was so little information [in the U.S.] on Cuba. MF: What was U.S. coverage of Cuba like then? Bravo: If you didn’t live in Miami, the media ignored Cuba. And in Miami all the news was negative. But that’s changing now, especially after the Elian story. I’m in the U.S. frequently, and I thought most stations except for Fox did pretty objective coverage. MF: How would you compare Cuban coverage of events in the U.S. with U.S. coverage of events in Cuba? Bravo: I believe that there’s no freedom of press anywhere. In the U.S. whoever owns the New York Times decides what goes in and how it goes in. In Cuba, it’s the government who decides. It is opening up a little now. With Elian, we had all the roundtable discussions. But you have to remember that Cuba is like a country in war, and the government is very [vigilant] about anything that they think will hurt the revolution. When there are better relations with the U.S., things will open up more. MF: Tell me about Operation Peter Pan. Most people in the U.S. don’t seem to know anything about it. Bravo: In the early 1960s, 14,000 Cuban children were sent out of Cuba by their parents to save them from the revolution. They were supported by the Catholic Church, which thought the parents would come over quickly. But then there was the Cuban Missile Crisis, and a lot of flights were shut down, so many kids were brought up in foster homes and orphanages throughout the U.S. They are the children of the Cold War. It’s largely an untold story. The CIA has refused to open these files. There’s this woman, Maria de los Angeles Torres, at De Paul University who’s a Peter Pan child, and she’s suing the CIA to get access to her files. MF: Does she know her parents? Bravo: Oh, yes. Most of the parents came four or five years later. But all these kids have a wound in them about the time of being alone. MF: Why did you decide to work on this as your next project? Bravo: I met the artist Ana Mendietta in 1978 at a talk she was giving in Soho. She was a Peter Pan person and she started telling me her story. I found her aunt here in Cuba and helped reunite them. All of that spurred me on to do this story. I’ve been working on it on and off for years since. MF: Has there been anything in the U.S. press about Operation Peter Pan? Bravo: Yvonne Conde wrote a book about it called Operation Pedro Pan, but it was also a book against Cuba. There have been a few TV programs in Miami about it. The more this story gets out there the better. MF: How did you go about tracking down Peter Pan kids for your documentary? Who else did you interview? Bravo: One person led to another. Just today I heard from these twins in Miami who want to talk about their experiences. I interviewed some of the parents, and Father Walsh is also in my film. He’s the main person in Miami who organized the operation. He says he got a call from the State Department saying they wanted to get children out of Cuba, but they couldn’t do it themselves. They needed an organization. They said they’d get him the money to do it. There’s been a lot of talk about the money and where it came from, but no one knows for sure. MF: Where do you get funding for your films? Bravo: I’m independent, so it depends on the film. Canada and Channel 4 in London have helped a lot. Eventually I give my films to Cuba, and they put them on the air. Well, not all of them. Bravo: It all goes back to that freedom of the press issue. The person who has the money to buy the press has all the freedom. If you think about it clearly, even the term human rights is [just as arbitrary]. How do Cubans define human rights? They say, well, a person has a right to free health care and free education. MF: Have any of your films been shown in the U.S.? Bravo: I’ve done 28 films now, and many are subtitled and distributed by Cinema Guild in New York. Many have been in film festivals in the U.S., in San Francisco and Chicago. One called Miami Havana was shown on P.O.V. and another, Cuban Excludables, about Cubans in prison in the U.S. without due process, was on PBS. MF: When do you think you’ll be done with Operation Peter Pan, and will it have a showing in the U.S.? Bravo: I’ll probably be done in January, and hopefully it’ll show there [in the Bay Area].